LiFi is the acronym of the Light-Fidelity. Whether you‘re using wireless internet in a coffee shop, stealing it from the guy next door, o or competing for bandwidth at a conference, you’ve probably gotten frustrated at the slow speeds you face when more than one device is tapped into the network.Nowadays every user focuses on high speed because Loading is mostly hated by the internet users. We all want to access data which we want to use in the high-speed internet. LiFi is such the technology which has brought a heavy revolution in the field of internet.What if we could use other waves to surf the internet? Illumination” taking the fiber out of fiber optics by sending data through an LED light bulb that varies in intensity faster than the human eye can follow. Li-Fi technology is based on LED to the transfer of data. The transmission of the data can be with the help of all kinds of light, no matter the part of the spectrum that they belong. That is, the light can belong to the invisible, ultraviolet or the visible part of the range. 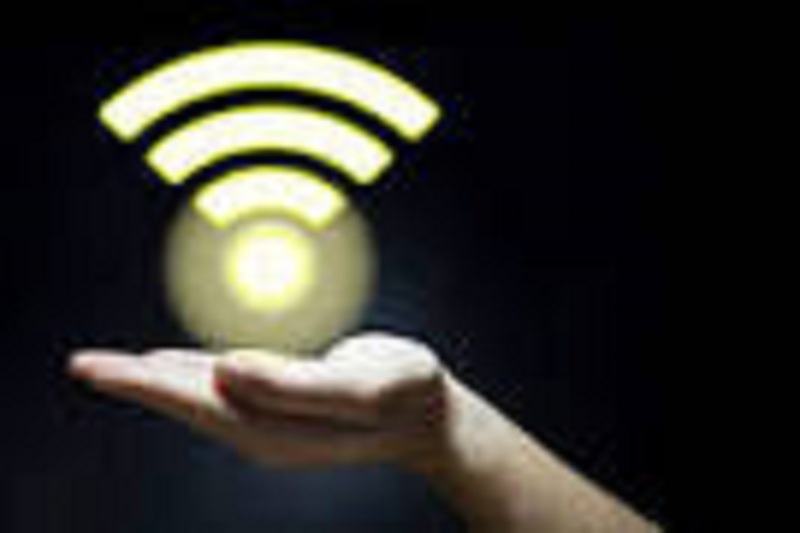 Li-Fi can be thought of as a light-based Wi-Fi. It uses light instead of radio waves for the transmit the information.Instead of using WI-Fi modems it uses transceiver-fitted LED lamps that can light a room as well as transmit and receive the information. Li-Fi was introduced in 1997 and presented by Harald Haas. Li-Fi has shown that it's 100 times faster than Wi-Fi. In October 2011, companies and industry groups formed the Li-Fi setup, to promote high-speed optical wireless system and to overcome the limited amount of radio-based wireless spectrum available by maneuver a completely different part of the electromagnetic spectrum. By August 2013, data rates of over 1.6 gbit/s were determine over a single color LED. in 2013, a press release said that Li-Fi, or VLC systems in general, do not require line-of-sight conditions. In October 2013, it was reported Chinese manufacturers were working on Li-Fi development kits. On 12th July he used a table lamp with an LED bulb to transmit a video if blooming flowers that projected onto a screen behind him. During the event, he periodically blocked the light from the lamp to prove that the fire was indeed the source of incoming data. Capacity is the main disadvantage of the running radio spectrum. As in the 21th era the number of users of the internet services has increased very fast. The increment in the name of users has bought the capacity problem. It has also high cost and less bandwidth than the Li-Fi. Due to the increment in the numbers of the internet users and the transmission of significant data the availability problem has befallen. Radio spectrum has the limited availability than the li-fi. It is not available in the aircraft. The efficiency of the radio spectrum has also decreased in the massive amount because the amount of data has increased in the considerable amount. It has a significant impact on the uses of the internet because it is the deciding factor of the data transfer speed. It has only 5% of total efficiency. Security is the most critical activity in the internet usages. It is the major of the importance of the data we store, transfer, use. Safety has decreased in the use of radio spectrum. Due to all these drawbacks, we are moving towards the Li-Fi. How do Li-Fi works, it works by an Estonian startup called Velmenni used a Li-Fi-enable light bulb to transmit data at speeds as fast as 1 gigabit per second, which is about 100 times faster than current Wi-Fi technology, meaning a high-definition film could be downloaded within seconds. As we are aware that due to increase in the number of users the radio waves are insufficient to fulfill the demand for high speed, so the Li-Fi concept came into existence.The operational procedure of li-fi is straightforward if the LED is ON you can transfer data and if the LED is OFF you can transfer digital 0. Every light source present will work as the hub. 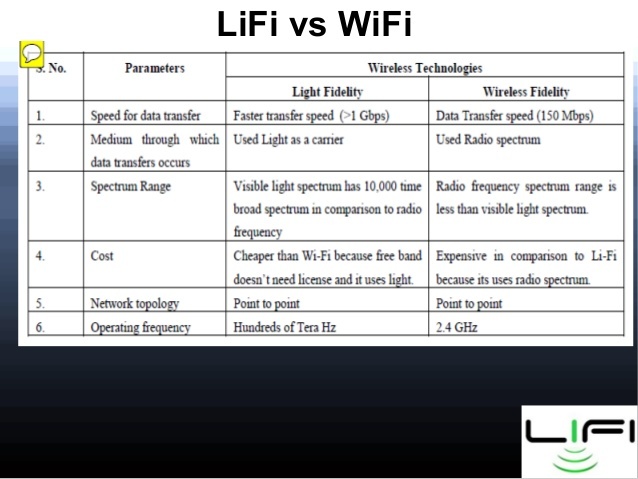 The difference between the li-fi and wifi has been shown below in the image form. Li-fi may be used in the traffic lights to ensure the excellent communication between the cars. As the vehicle has the LED headlights so it can surely transmit the signal to each other and prevent the accidents. The significant disadvantage of the wifi was the limited bandwidth, and also it was not for aircrafts. But LiFi is being used in the airlines also. It will be used where ever the LED lights are. Li-fi will be applicable in the hospitals also in future. Many medical instruments will work on the li-fi. It will automate the traditional methods of the surgery. Li-fi can also be used in the deep oceans too where the wifi fails completely. This will help in the navigation. It will also help the military system also. * Street lights can also be used as the free access points. * It will reduce the electricity bills and also the maintenance bill. * The significant disadvantage of the li-fi is that "light can't pass through objects." * Interfaces from external sources like sun light, standard bulb, the thick material in the path of transmission will cause an interruption in the communication. * The installation charge(cost) of the VLC( Visible Light Communication) is very high. This makes the system cost. * One of the most significant challenges in the li-fi system is that how a device which is currently receiving the data will transmit back the information to the transmitter. * A whole new setup should be created for the li-fi system. * The complete data transmission process maybe affected by the small light of sources. Now at this stages we have known about the li-fi technology. So let's conclude the entire information in short. Li-fi is the high-speed technology for the data transfer. It does not need any medium for the data transmission process. Li-fi is costly and also can't transfer through walls. Li-fi can be easily extended with the help of array. It will create a revolution in the field of data transfer. There are some countries where li-fi is being used such as china, Russia but in the small extent. If you have any queries related to this post then. You are free to ask me. Here are the links to my Gmail and Linkedin, you can just comment your views about my article. If you really liked my article, then please like this and follow. I believe there is more to Lifi technology. Over here in Africa, WiFi has kept us connected. How much a technology that's 100 times faster than WiFi. I can imagine how awesome that would be. Though, as you've said, the cost remains a big limitation. Welcome to my Page "Techmak". We at Techmak focus to provide you quality content related to the technology. Here you will be updated with the latest technology news article.